Digital Sisterhood Month 2010 was the Digital Sisterhood Network’s first celebration of women online and the connections they make, conversations they have, communities they build, causes they support, collaborative partnerships they establish, and commerce they engage in with women they meet online and offline. It was an amazing December! Click here to read what happened. 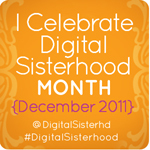 The second annual Digital Sisterhood Month begins on December 1, 2011. The theme is “Celebrate the 4 Fs of Women’s Health: Feelings, Food, Fitness & Fierce Living.” Click here to watch a video about the theme. 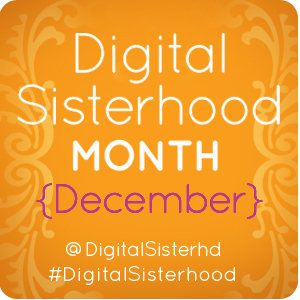 Bookmark the web sites below to stay updated on Digital Sisterhood Month’s online events. Everywhere, a woman-owned marketing and communications agency specializing in results driven social media strategy and execution, is the main sponsor of Digital Sisterhood Month’s meetups held on December 2, 4, 6, 10, and 13 in Washington, DC. The agency provided numerous jewelry giveaways made by artisans in East Africa and Haiti who participate in a partnership with Fairwinds Trading and Macy’s. Jewelry from Macy’s Heart of Haiti collection is prominently featured. The Heart of Haiti plays a major role in the life of Ananda Leeke, Digital Sisterhood Network’s founder. She serves as a Heart of Haiti Blogger Ambassador and traveled to Haiti with Everywhere and Fairwinds Trading in February 2011. Susan G. Komen for the Cure, a global leader of the breast cancer movement and the world’s largest grassroots network of breast cancer survivors and activists, provided breast cancer awareness information, bookmarks, postcards, medallions, and pins for the Fierce Living in Fashion Tweetup held at Violet Boutique on December 13. Shootie Girl, a family business that creates unique t-shirts that spark conversation, provided two gift certificates for the Fierce Living in Fashion Tweetup held at Violet Boutique on December 13 and the #dsprblogchat for fashion public relations professionals and fashion bloggers held on December 14 via Twitter. Shootie Girl t-shirts focus on positive messages for women and girls. They include stunning artwork with the highest quality rhinestones. The Fierce Living Campaign begins December 1 on Facebook and Twitter. The campaign will feature daily Facebook posts and tweets that honor women who use their social media presence to build community for women; to empower and inform women and girls; to do social good and advocate for causes that impact women and girls; to coach, encourage, and inspire women to feel and think positively, to dream big and live full lives, to experience happiness and joy, and to express loving kindness and compassion; to promote fitness, healthy eating, and healthy living; and to share how their health journeys have helped them reinvent their lives. Guest Blogger Series begins on https://digitalsisterhood.wordpress.com and http://digitalsisterhood.tumblr.com. Digital Sisterhood Unplugged Sunday – Unplug from your tech tools and life for a few hours or all day! Hi Soror Leeke – I think this would be a great time to for the Digital Sisterhood to talk about Lupus a chronic autoimmune disorder that strikes mostly women of childbearing age. I would love to contribute a guest blog and connect you with others in the lupus community. Katina Rae Stapleton, Butterfly Lessons: Living a Fabulous Life with Lupus (http://butterflylessons.com). So good to finally meet you in person at the Blogalicious – BPRSDC event last night. Thank you Katina for responding. I love your idea. I plan to contact you in coming weeks to schedule a guest blog post. FYI – I will be interviewing Raquel Dozier, founder of Lupus in Color, on Digital Sisterhood Radio in December. I love the idea of Fierce Living. I just finished reading Tina Fey’s Bossy Pants and there’s an important thought in there about women being bossy and not being taken seriously as a leader. How do we have to be fierce to lead the fabulous lives we want to lead. There’s a reason you picked the word “fierce” and there’s a lot to explore in that. So what’s good about fierce and what’s bad? Definitely look forward to participating. Thanks Danica for the love. More information is coming on the word fierce! Hi Virginia. Thank you for dropping by and tweeting with us on Digital Sisterhood Wednesday today. 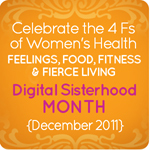 I love that you are excited about Digital Sisterhood Month. We need your positive energy and support. I love your Kiss Chronicles blog. I read the mission and the blog about your dad and brother’s cancer journeys. My prayers are with their spirits and your family. 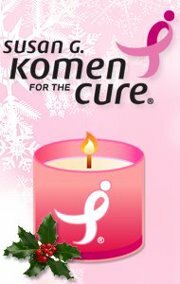 My grandmothers both had breast cancer. So cancer is a part of my family’s journey too. Would you like to write a guest blog about what it fierce living means as it relates to your Kiss Chronicles blog’s social good efforts in December? Write me on kiamshaleeke@yahoo.com. Hi Ananda! I would like to discuss certain tradeoffs and sacrifices that we in the sisterhood can do in order to stay healthy. For example, I gave up soda in August. I was such a soda addict I actually had a budget for it. But since being off of soda, it changed my health completely and saved me some money (which I used to upgrade my gym membership and am now actively working out and taking classes). Of course, there are other things we can do to help keep us looking and feeling great, but you get the general gist of it. Hi Lady! Thanks for responding. Would you like to be one of the featured guests on the DS Month Twitter Chat dedicated to how women and organizations that promote healthy food and nutrition in their lives? It will be held on December 14 from 8:00 pm to 9:00 pm? We are scheduling three other chats about how women and organizations that promote positive feelings, coaching, therapy, and dealing with mental health awareness and issues on December 7, how women and organizations promote fitness, yoga, and other movement practices on December 21, and how women and organizations promote fierce living a/k/a living fully or passionately or living your dreams on December 28. Our Digital Sisterhood Network Intern Chanel Cole will be leading the Twitter chats. I will be on board to support her and participate in the Twitter chat.